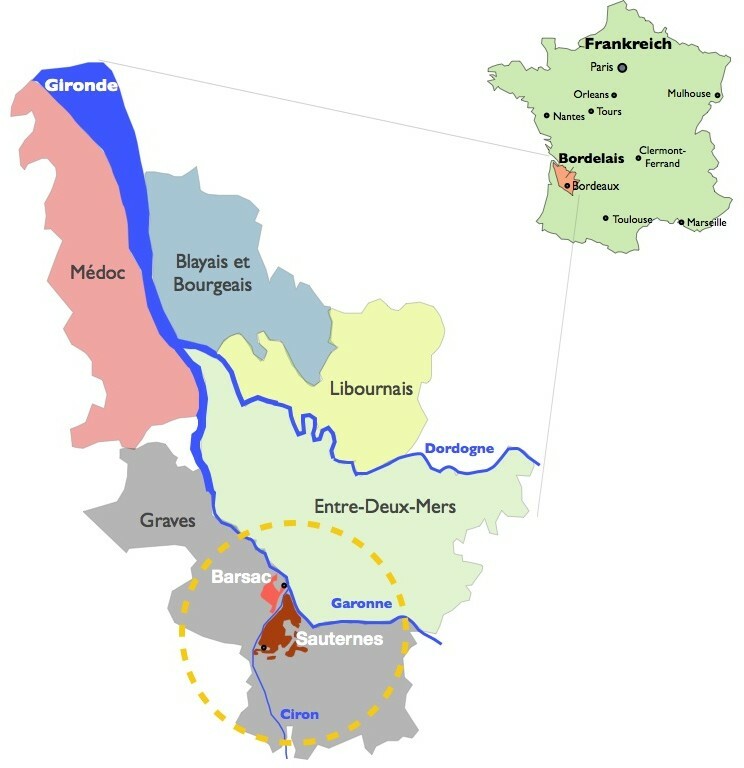 The Sauternes region is located about 40 km southeast of Bordeaux, on the Garonne and its tributary Ciron and covers about 2,000 hectares of cultivated land in the five communities of Barsac, Sauternes, Bommes, Fargues and Preignac. While all five municipalities may use the name Sauternes for their sweet wine, the Barsac region is also allowed to label their wines with the appellation name Barsac. The vineyards are on a soil of calcareous clay or limestone covered with coarse gravel, the most renowed locations on top of the ridge of the hilly landscape. In addition, there are also locations with clay feldspar and sandy silt, such as Suduirat or Sigalas-Rabaud. Barsac, on the west bank of the Ciron, lies on a flood plain with sandy and calcareous soils. Sauternes has a maritime climate, which due to the location on the two rivers has good conditions for the development of noble rot. The fog that develops in autumn, when the cooler waters of the Ciron flow into the warm Garonne, wet the grapes during the night, which promotes the development of noble rot (Botrytis). By noon, the mists mostly give way to the sun, the grapes dry and are thus preserved from rottenness.